Ben Thomas took Cheshire to the BBL Cup in his first season as head coach. 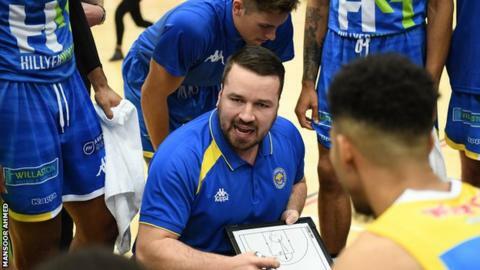 Cheshire Phoenix coach Ben Thomas says his team are still hungry for success ahead of the BBL Play-offs. Phoenix won the BBL Cup last season but finished outside the top eight teams, failing to make the play-offs. With five weekends remaining, Cheshire are seventh in the table and play fellow-contenders Bristol in this week's BBC televised game on Sunday. "It's very interesting from fifth place down," he said. "Any team can beat any team you can take nothing for granted." "You look at London playing Glasgow - everyone said that was London Lions' game and then they got turned around by Glasgow. You've got to turn up to play every night." The play-offs run-in is the time when a team can prove itself, Thomas told BBC Sport. "You don't hide the league table from the players - everyone knows that every single minute of every single game counts from now until the end of the season," he said. The Cup win's given everyone around the club a taste of success and made everyone a little more hungry for success."